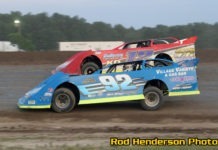 BRIGHTON, ONT – On a hot night, fans were treated to even hotter side by side racing action at Brighton Speedway Saturday night. The popular Gord’s Water Vantastics returned bringing another full card of racing action. The night presented by Bellevue Fabricating and Campbellford Chrysler also featured the Lava Clean Comp 4 Triple Crown Race 3, Late Models, Canadian Modifieds, Thunder Stocks and Stingers.